There’s a certain type of client who’s naturally drawn to Amy Butcher’s work. And there’s a certain type of client Amy Butcher is naturally drawn to. Amy helps nonprofits, research institutes, and public sector agencies craft ultra-effective content. Her words help them get more support and more donations. Her words help them change the world. Once a month here on Copyblogger, we tap the collective wisdom of our community members to bring you reports from the front lines of the content marketing world. For this month’s Hero’s Journey feature, I asked Amy to remove her superhero cape momentarily to tell us more about her business — who she helps, and how she helps them. Here are her answers in her own words. Amy Butcher: I’m a translator, writer, content marketing consultant, and editor. I help organizations use content to get more support. And I help self-published authors take their memoirs, business books, and novels to the next level to drive book sales. Overall, I tend to connect with people who are passionate about helping others and changing the world. Amy Butcher: I offer my clients both structure and style. I help them organize their content in clear ways while adding a dash of ye’ old razzmatazz. I don’t sit around talking about content problems. 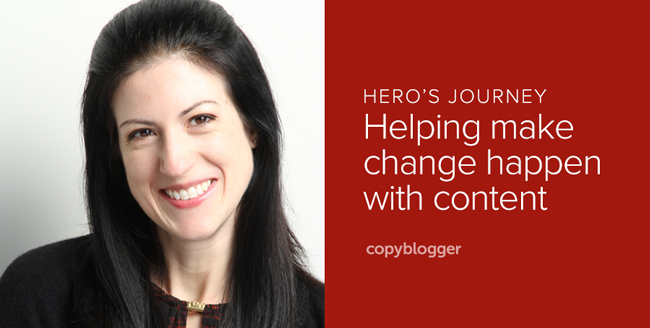 I get on with hunting them down and fixing them with my trusty utility belt, courtesy of Copyblogger. The content I create serves as a vital bridge between my clients’ visions and their audience’s needs. This can be so hard for people to build themselves. Amy Butcher: I’m a translator and editor by trade, and I started my career in communications, so my freelance business started from those contacts and grew by word of mouth. When I was but a wee lass, I pictured myself becoming a writer who would teach grammar at a university, but my love of French led to a career path in translation and editing. I went that way because I thought that was what any self-respecting language nerd should do. I had chosen the easier way to make a living, but the writer in me finally woke up from her coma and seal-slapped me across the face. Then I found Copyblogger and discovered content marketing and content strategy. I was able to shift gears and provide more value than just your average bilingual comma jockey. And this approach is working for me. Amy Butcher: The problem with being a superhero? With great power comes an even greater superhero complex. My penchant for self-reliance has led to not only burnout but also hair-pulling, jaw-grinding, and a deep despair that they don’t sell parts to my Self-Cloner 3000. I always felt that I had to go it alone. But a while back, I listened to an Unemployable with Brian Clark webinar featuring Chris Ducker about this very topic. I came to the hard realization that the problem isn’t other people: it’s me. I’m the one who hasn’t taken the time to truly explain to assistants or subcontractors what I need them to do. That’s a bitter pill to swallow but also a wake-up call, and I’ve been thinking about processes to hire people to help my business. Right now, I have help for a website coding job that I used to try to solve myself, so that is at least a step in the right direction. As a small business owner, putting on the big-league jersey and claiming your rightful place on the field means understanding the value of a team. I’m still learning that. Amy Butcher: My writing work and guest blogging are going well. Although I’m just starting out with guest blogging, I can already see its power in getting the word out about my business. Also, for all clients, I try to communicate an extreme passion for what I do and figure out how to “wow” them and exceed their expectations. These basic principles should surprise no one, but it’s amazing how far simple things like a solid work ethic, intense discipline, and respect for others can take you. Which Rainmaker Digital products do you use, and how do you use them? Amy Butcher: I’m a Certified Content Marketer, so I’m a member of Authority. With the Teaching Sells course, I built a new site for my nonprofit clients that I’m really proud of and has received a great response, and I’m going to use this as a platform for future educational products. Some of the greatest value I’ve gotten from Copyblogger are the monthly Content Marketer Certification calls, which have given me a direct line to Sonia Simone and Brian Clark. They solved problems for my business in two minutes that I would agonize over for months! My advice to anyone in a similar situation is don’t waste time agonizing. Just get over yourself, fork over the cash to talk to an expert, and then just do whatever the heck they say. Don’t hem and haw. Don’t give excuses about why it won’t work for you. Just get in the damn ring. Amy Butcher: Even as a one-person operation, I’m bent on developing my own little media empire, even if it’s somewhat dollhouse in size. And my initial idea of teaching is now something I can easily do, and I don’t have to wait around for a university to hire me or (even better) conform to their ideas of what a curriculum is supposed to be. Amy Butcher: I get really jazzed about helping clients figure out what they want to say or helping them shape a creative vision into something logical and structured. Sometimes I have to rein people in from going off the deep end, but I mostly have to push them to develop their ideas. We all have to combat “first draft syndrome” — that’s when you fall in love with your initial ideas, as though every single word or thought from your head is dripping with honey and gold. Big-time authors rewrite their work dozens — if not hundreds — of times. Content marketers often say that you have to ‘think like a publisher.’ But I personally don’t give that advice, as many publishers are actually not very successful and don’t make a lot of money! Instead, my advice to any client — whether they’re a writer, small business, or nonprofit — is to “think like a bestselling author,” which means gaining a deep understanding of your own “genre” so that you understand the obligatory conventions while giving your prospects a new experience within those constraints. As business owners, we have to understand the genre in which we’ve decided to produce value. And in business, our genre is made of the real needs of real people. Thanks to Amy for appearing in our Hero’s Journey series.